Inspiring women changing the auto industry from the inside was the focus of the 3rd annual What Drives Her luncheon and panel discussion. 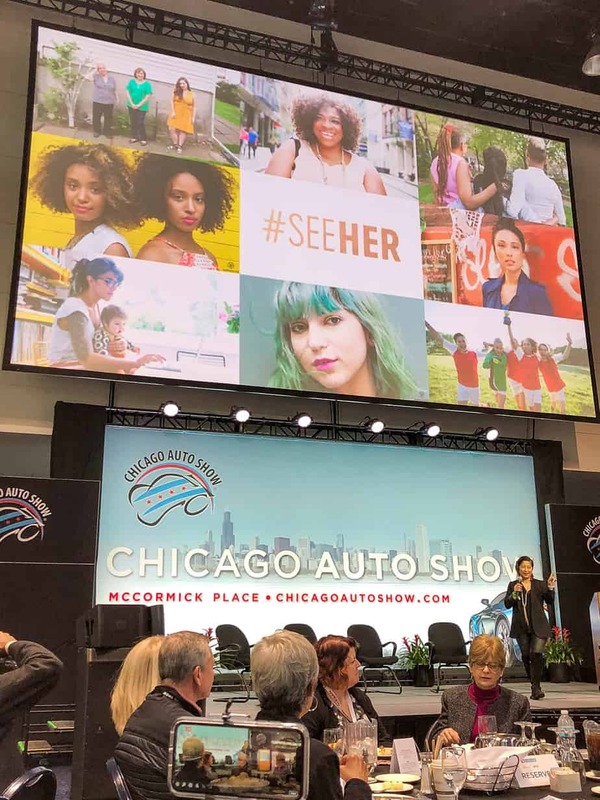 I was so looking forward to this event sponsored by A Girl’s Guide to Cars, Women in Automotive, and The Chicago Auto Show. The diverse group of women sharing candid stories of overcoming challenges and excelling in a male-dominated field stirred and motivated everyone in attendance! They urged each of us in attendance to use the drive and passion in our possession to create a path that leads to happiness! There’s something to be said about the energy in a room full of women championing other women to be the best version of themselves. That spark drives you as you excitedly contemplate how you’ll make an application. It stays with you. You’ll later draw from that same incitement in those moments where fear and doubt creep in. This event hit the spot for me! The speakers bought to light sobering statistics regarding the under-service of women in advertising and the automotive industry. For example, it was revealed that women account for or influence 85% of car purchases and hold the keys to 450 billion dollars a year in spending. However, additional figures indicate that women account for only 25% of jobs in the automotive field. We learned about the #seeher initiative. A movement bringing about needed changes in the way females are portrayed in advertising and the media. Many women feel underrepresented in advertising or negatively portrayed. I know I do. Having open honest discussions regarding the imbalances is the beginning of change. The array of influential women speakers in leadership roles from various backgrounds debunked the myths that automotive careers belong to technicians or salespersons. There are many doors of opportunity. Autotrader’s Michelle Krebs moderated the topic involving change. Panelists included Jessica Petty, manager of customer data analytics, Hyundai; Jeneen Rippey, vice president of global quality, electronics division, ZF; and Edie Wines, instructor, National Automobile Dealers Association. Wines, an instructor for the National Auto Dealers Association (NADA) has been in the business for over 33 years. She began with a temporary assignment in the automotive service department. Eventually, Wines learned all but one job in the service department including service adviser. This was unheard of in the majority-male field in the 1980s. She offered instruction to women coming into the industry or moving up the ladder “If you find yourself in an environment where you’re the only woman, don’t focus on that…it’s about performance level and not about the numbers…..show them your abilities and follow your dreams. Tanya Wingfield, vice president of engineering for Borg Warner concurred, reminding the room that there are many male-dominated industries, not just automotive. She exhorted attendees “don’t put yourself in a box or allow anyone else to….be yourself ,work hard; As a result, opportunities will follow.” She also advised all to find a mentor whether it be a male or female. Young girls and women were cautioned in regards to overlooking options. Explaining, one need not be super interested in cars to be in the automotive industry. Design, Engineering and computer science are exciting ways to get involved. There is a major need for qualified technicians and women were encouraged to consider this field. It’s not the grease monkey, dirt under fingernails job of the past and it can be highly lucrative. The second-panel discussion moderated by Cars.com Editor-in-Chief, Jennifer Newman, centered around work, life, and creating balance while building or sustaining a career. Speakers included Kathy Gilbert, global director of sales & business development, CDK; Laurie King, SVP, global operations & strategic solutions, Turtle Wax; Subi Ghosh, senior director of dealer strategy, Stream Companies; Lauren Brandt, Facebook client solutions manager and Returnity Project co-founder; and Kerri Wise, vice president, industry education and relations, TrueCar. I appreciated how the ladies kept it real by stating that they’re not perfect and each day they’re learning more about balance. We women sometimes have a difficult time admitting this. Oftentimes, we strive for perfection to prove to the world that we have it all together all of the time. This actually is the opposite of balance and is quite unhealthy. The candid dialogue taking place on stage hit home with me. When asked for advice on finding balance, the ladies had much to day. The following statements resonated with me. Solid advice to carry in life. I truly enjoyed the insightful conversations that occurred at the What Drives her panel as well as the networking afterward during the wine reception. I connected with many wonderful women and left feeling enthused and motivated. Be sure to catch the Chicago auto show during its run at McCormick Place! *Sponsored post; all opinions are my own. Great read. Im not a car person, but i found this interesting and with some very sound advice for all women. Great advice for young girls thinking about what they want to pursue after High School.